Public bioethics — the governance of science, medicine, and biotechnology in the name of ethical goods — is an emerging area of American law. The field uniquely combines scientific knowledge, moral reasoning, and prudential judgments about democratic decision making. It has captured the attention of officials in every branch of government, as well as the American public itself. Public questions (such as those relating to the law of abortion, the federal funding of embryonic stem cell research, and the regulation of end-of-life decision making) continue to roil the public square. This Article examines the question of how scientific methods and principles can and should be integrated into the making and enforcement of laws in this domain without compromising the integrity of science, the democratic legitimacy of government, or both. It identifies, analyzes and critiques one prominent model of integration, namely, the proposal to delegate virtually all public bioethical questions to scientific experts for resolution solely using the tools of their respective disciplines. The Article argues that this model of integration raises serious prudential concerns relating to democratic accountability (and thus legitimacy). More deeply, it argues that the proposal is unsustainable in principle because of the fundamental conceptual incompatibility between the premises and methods of modern science and the ethical principles that comprise the currency of public bioethical deliberation. 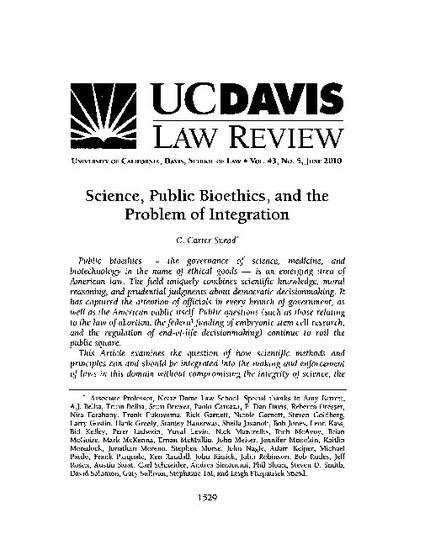 It concludes by offering a provisional way forward, arguing that integration should be a function of defining and policing the boundaries of scientific methods and ethical reasoning, according to their respective competencies for the particular public bioethical question at issue. The Article provides an analytic tool to facilitate this line drawing, and illustrates its application with reference to several contemporary debates within public bioethics (i.e., the recent FDA approval of Plan B emergency contraception, the federal funding of embryonic stem cell research, and the impact of cognitive neuroscience on theories of criminal punishment). Reprinted with permission of U.C. Davis Law Review.